Bulawayo24 NEWS | The man who filmed 'The Angel' at T.B. Joshua's church speaks out! The controversy surrounding the alleged 'angelic sighting' last month in Lagos, Nigeria has refused to abate. In January 2018, a video uploaded to YouTube showing a flashy figure in white purportedly crossing the road and entering The Synagogue, Church Of All Nations (SCOAN) premises sparked huge debate on social media and subsequently went viral. The man behind the clip surfaced on Sunday 11th February 2018 to share a testimony at The SCOAN of the circumstances behind the now famous footage. Mr Hezron Konlan, a Ghanaian by origin, said that during his first visit to The SCOAN, he was unable to enter the main auditorium on Sunday due to the large crowds. Slightly disappointed and seated in a vehicle outside the church the following day, preparing to return to his homeland, the young man said he "prayed that God would give him a sign" to prove the church was genuine and his visit worthwhile. Whilst offering the prayer, Hezron was "moved" to bring out his mobile device and take a recording of the impressive church edifice. "Suddenly, I saw a huge figure dressed in white on top of an animal which can be likened to a horse crossing the road and entering the Church," the Ghanaian vividly recounted. Dazed, Hezron looked up from his phone and exclaimed to his friend Joshua Laar, who later corroborated his account of events, that he had just seen something "physically". Playing back the recording, Hezron said he was astounded to discover that his phone had captured the "supernatural sighting", which he subsequently shared with his friends, one of whom later posted it onto YouTube. 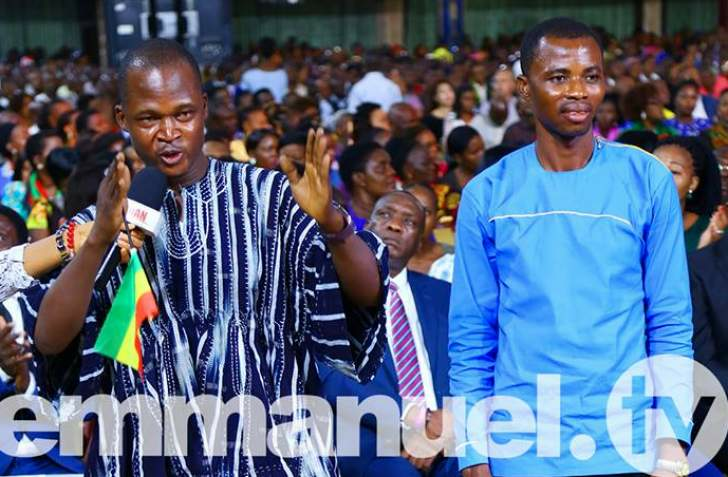 "Since that encounter, my life has completely changed," the young Ghanaian testified, explaining that his visit to The SCOAN triggered a remarkable chain of events which culminated in promotion at his workplace. "Truly, the Almighty God and His angels are here in The SCOAN," he emphatically declared. The clip, which has been seen over 500,000 times since it was published on Emmanuel TV's YouTube channel, has additionally been the subject of several global media reports. Although opinions significantly vary, the majority of comments on the YouTube clip suggest Hezron did indeed capture some form of "angelic being".